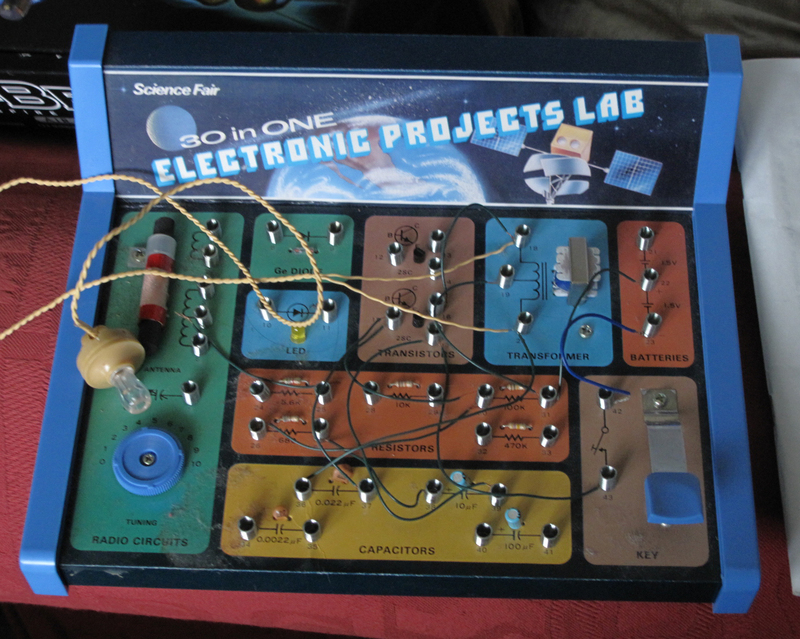 OK, this wasn’t the most versatile circuit I’d ever built – but it wasn’t the most difficult; and, more importantly, it illustrates an important source of inspiration which could easily be overlooked – the ‘educational’ electronics kit. I remember when I was very young, receiving one of these for Christmas, produced by Philips – my first exposure to the world of electronics, I suppose – and being fascinated by making lamps flash on and off (this was before the invention of the LED! ), and listening to Radio Luxembourg (and before Radio 1 . . .) through a single crystal earpiece. 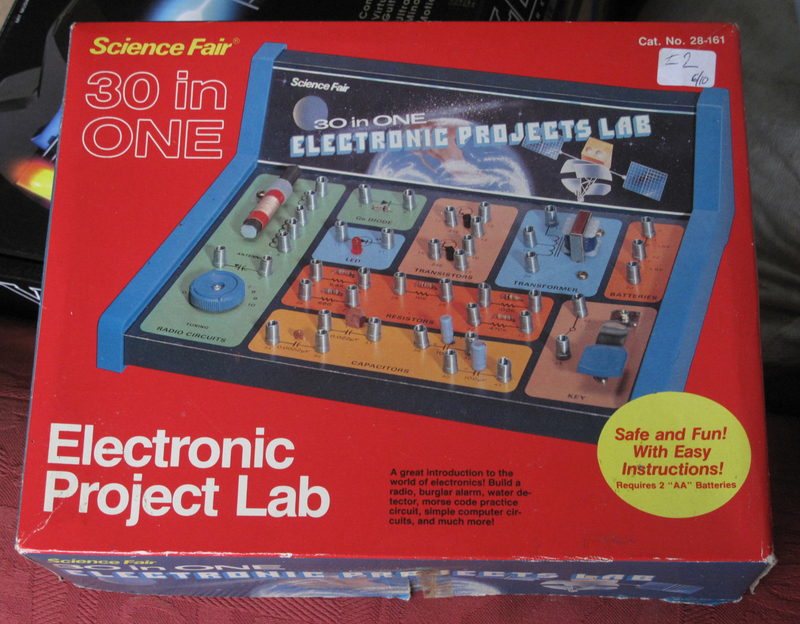 So I was delighted, when staying in Leeds for a few days recently and popping into a small neighbourhood charity shop, to find this Radio Shack 30-in-One Electronic Project Lab. Each one was described like this, the various different components are explained, and users are encouraged to experiment with the circuits they make. 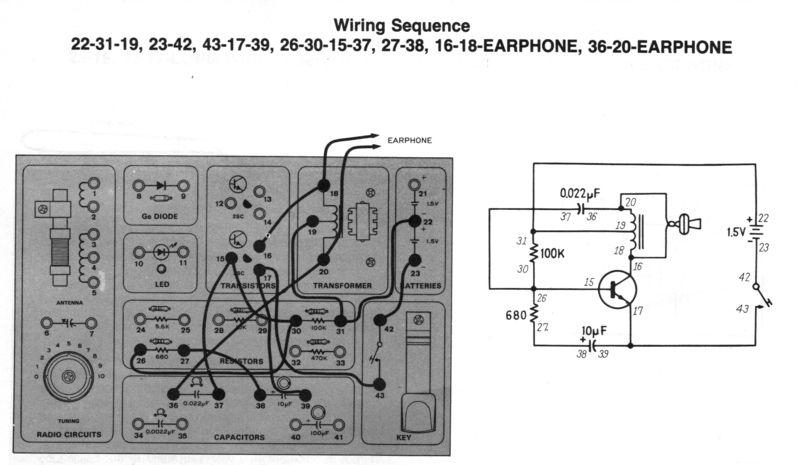 The booklet gives not only the necessary wiring instructions, but also a circuit diagram. This would enable you, should you be so minded, to solder together a permanent version of any of the projects described. It wasn’t necessary to put the earpiece in the ear – the sound was perfectly loud enough to be heard around the room, a point on which my very patient hosts were too polite to comment. In fact, I did need to replace the earpiece, which wasn’t functioning quite correctly, but the other components I needed all worked fine. So, my advice is to keep an eye out for these kits if you see them going cheap: there are bound to be music or sound circuits you can make – and there’ll be opportunities to modify them if you have the knowledge and expertise. Mine is certainly now going cheep and will, I’m sure, find its place alongside, perhaps, the Cracklephone, which also has distinct bird-like qualities.